Ryan Brody. Ryan was part of our Personal Best training program. At the start of the program, Ryan’s best 5K race was over 27 minutes. At some of our first training runs, Ryan was having trouble keeping an even pace. But we worked on it and we did specific workouts to help Ryan run an even pace. Ryan has mastered this skill. At Hop Dash, Ryan ran splits of 7:53, 7:54, and 7:36. He had a finish time of 24:36, a personal best by over 3 minutes. Ryan ran smart by holding back early, but was also able to dig in and really push himself. This helped him run such a tremendous race. Lynn Reed. Lynn started in our No Boundaries program in the spring, with the hopes of running in her first 5k. Lynn was nervous about taking up running, but wanted to give it a try. We started very gradually, mostly walking in that first program. But each week Lynn got a little stronger. By the end of the program Lynn was running the entire distance and ran her first 5k with our group at the Library Loop in Camp Hill in a time of 38:38. This was a fantastic time for a new runner! Lynn wasn’t done. 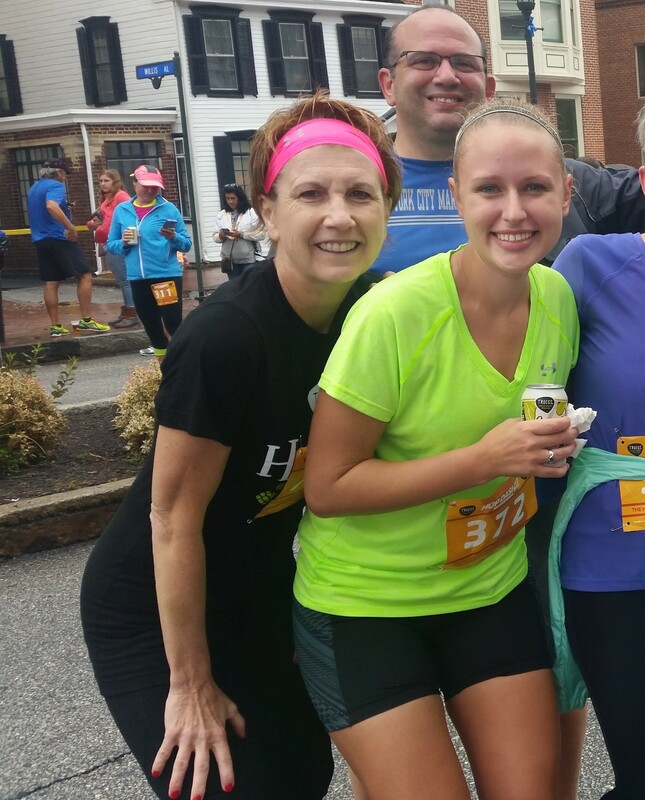 Lynn kept training, wanting to keep the momentum going and joined our Personal Best training group and improved again down to 34:18 at the Hop Dash this weekend! Kathy Shank. Kathy has run several half marathon and marathon programs with us. Kathy seems to run a PR every time she races. Kathy broke 2 hours for the half marathon, then broke 4 hours at last year’s Harrisburg Marathon. This year, training for the Steamtown marathon, Kathy surprised herself even more. Kathy ran 3:41 (a 12 minute PR) at the Steamtown marathon finishing 2nd in her age group! Jeff Paladina. Jeff, also a seasoned marathoner, has been trying to break his PR of 4:09 in the marathon. Jeff has trained very hard for several seasons and has come up short of running a new best time after many attempts and thousands of miles trained. Finally, at the 2016 Steamtown marathon, Jeff ran a 4:06 marathon PR and putt himself in range to start thinking about the elusive 4 hour mark. I could write a book about all of our participants and their amazing accomplishments. I’m proud of each and every one of them. Congratulations to everyone who has completed a race and good luck to everyone still preparing for a fall race. We inspire each other through the hard work and sacrifices made to earn a result. It is truly a dream come true to be running in this community. Thank you for making us better runners and better people.